Happy President's Day. I like long weekends, especially those that extend through the entire week. My kids are off from school so I'm taking the week off as well. Unlike many of the people we know we're not heading off to warmer climates this week. There's plenty to do here, like shoveling three inches of snow of the driveway this morning. This morning I was playing around on a site called Athlinks that aggregates races in a database and allows participants to "claim" their events. 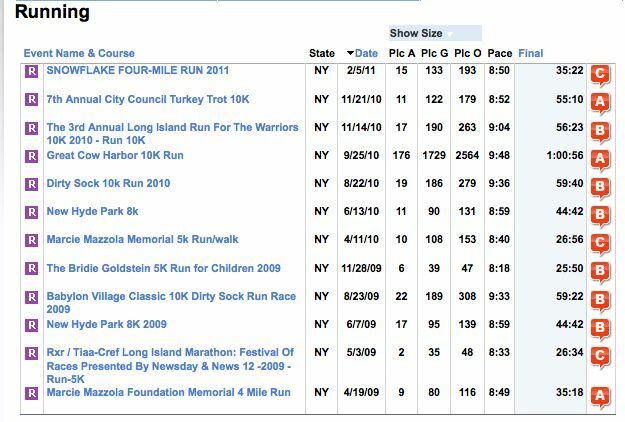 Once done, a runner has a collection of their race results and the usual social networking tools (profile, pictures, Twitter feed, etc.) for sharing or member interaction. Those features are common now but Athlinks also provides a list of your rivals and how you've performed against them. 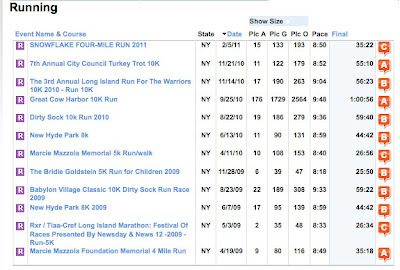 Athlinks automatically finds runners who have raced against you and lists their age, gender and won-lost record. It was interesting to see someone I've beat 7 times (he's 78) and a couple of others who have trounced me 5-0. Those who have beat me multiple times have usually outpaced me by one or more minutes per mile. I'll likely lose to them in future match-ups. The interesting comparisons are those where I've both won and lost to the same person. Those people are truly rivals and it's about our readiness on race day and how well we leverage or react to race day conditions. I still prefer to view racing as "me versus myself" and I don't really view these people as rivals. These race day match-ups are more like benchmarks that will help me understand how close I came to reaching my potential. i confess it's been awhile since i read your posts, tho your hm training sounds like it's coming along well. i had wanted to reply to a post i saw where you were debating prep for half marathon speedwork. i think we're pretty similar in terms of speed (and i'm willing to bet you'll be outpacing me by end of year if you keep at it! ), but i've been running a (relatively) long time and have done a few longer races so i'll offer some input. you mentioned tempos and a shorter race or two (that's good). but you said you didn't think you'd be able to incorporate much track work b/c of time constraints. i wanted to say that you can do similar workouts on the road (i did that awhile ago when i wasn't close to a track). sets of 4-6 x half mile repeats are easy to implement into your weekly plan- do them on a route where you feel comfortable. hill repeats are also good training. none of those workouts will take longer than your usual 3-6 mile (?) morning run. 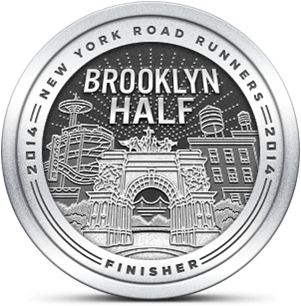 another thought...i'd try to do a 10k before the half. even if you don't run it "hard". it'll just give you an idea of hm pacing...the mcmillan running site is good for gauging paces. Wow, thanks Carla! I think my biggest issue with repeats is self discipline. Although I often think of doing more interval training I tend to default to my usual workouts because it's easier and, frankly, more enjoyable. My morning runs are limited by schedule to 23-26 minutes so I rarely cover more than 2.75 miles on those days and there are no useful hills in the neighborhood. There is a good flat section of the middle school parking lot that might work for 100 meter repeats. I'm going to try that one morning next week. Your point about running the 10K is good. I've got a 5K scheduled in between now and the HM that I want to run because it's for a great cause. Instead of a 10K I'll likely do 10K+ training runs every weekend that I can. Nice to hear from you. Thanks for your comments.